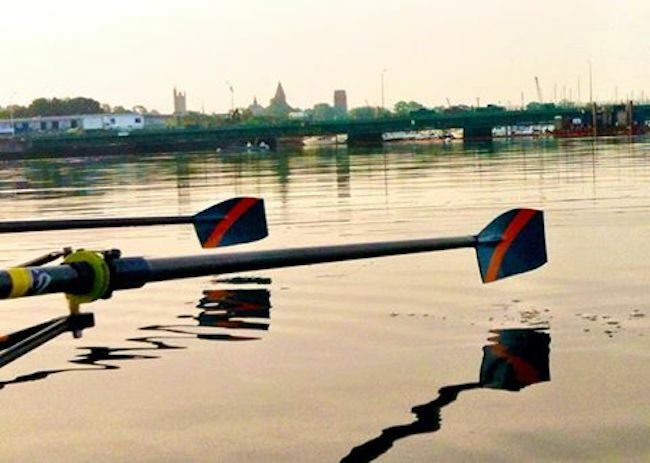 Last winter, when most rowers were staying in shape by working out (“erging”) on the Center’s “fleet” of Concept 2 indoor rowing machines, volunteer Ivy MacMahon was busy in the boathouse on Popes Island overseeing the installation of a new steering system in the Center’s Filippi four-oared shell, a boat designed and produced at the Filippi boatyard in Donoratico, a stone’s throw from the Tyrrhenian Sea in northwestern Italy. 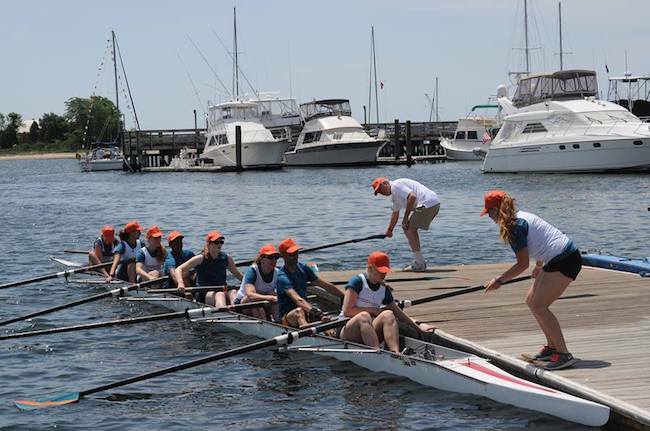 Following the installation of the new steering cables, another volunteer, Aryanna Taylor expertly restored the boat’s “cox-box”, an electronic device used in competitive rowing that combines a digital stroke-rate monitor and elapsed-time readout with a voice amplifier. 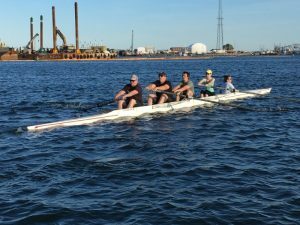 Soon thereafter, recently elected member of the NBRC Board, Cape Cod rowing legend Judi Eitas, installed that voice amplifier, which enables a bow-seated coxswain to communicate with the rowers. Finally, NBRC volunteer Vyto Eitas put all the elbow grease he could muster into refinishing the surface of the hull, so that the sleek racing craft would be ready when the Rowing Center’s members started practice this past spring. 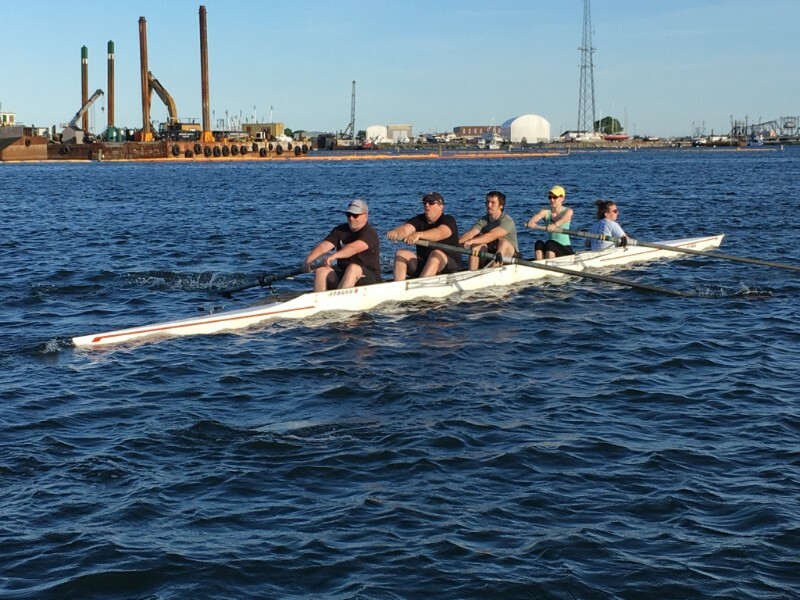 Here we see a well-trained master crew from New Bedford Rowing Center recently testing the Filippi shell and enjoying pleasant June weather on the waters of the City’s historic harbor. 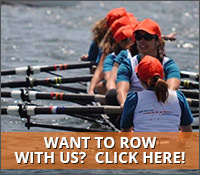 Stroked by veteran rower Stacy Reidy, with Dave and Ryan Haskell in the “engine room” and Erin Murphy handling the bow oar, this foursome is shown taking orders from highly regarded coxswain, Hana Haskell, who clearly relishes the rare opportunity to command her father and brother to do her bidding. 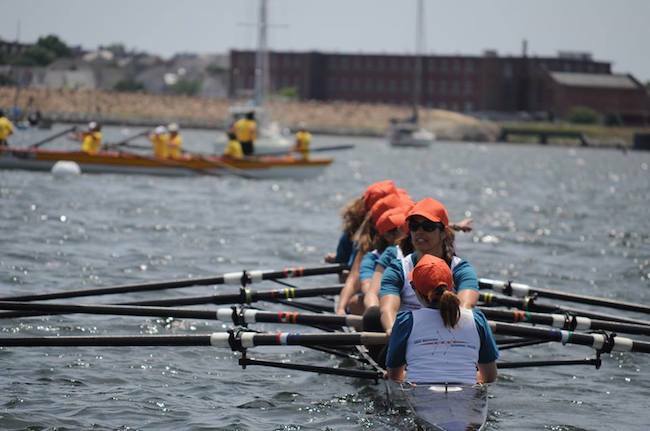 Although the row was considered a complete success, the customary post-victory tossing of the coxswain into the water will have to await the crew’s next triumph at a USRowing-sanctioned regatta this summer.